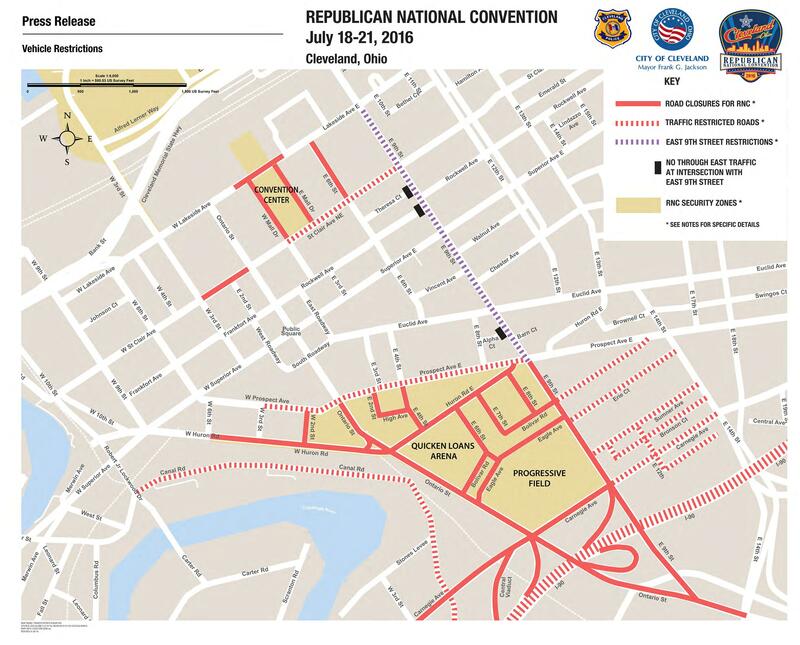 Law Enforcement and Public Safety Agencies have announced the Security and Traffic Restrictions for the Republican National Convention (RNC) in Cleveland, Ohio. Events and activities encompassing this designated National Special Security Event will take place Sunday, July 17 through Thursday, July 21. Security and transportation plans have been developed by a partnership of local, state and federal law enforcement and public safety agencies outlined above. Every effort has been made to minimize the impact of these safety measures on the public. 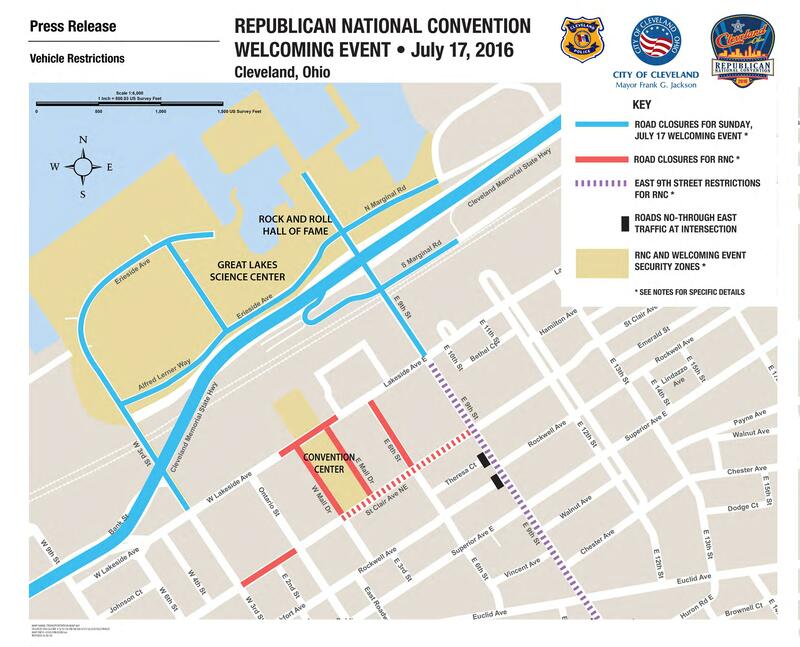 Only individuals with credentials/tickets will be allowed access to the Republican National Convention Complex (RNCC), which consists of the Quicken Loans Arena and Progressive Field, and the Huntington Convention Center, which will serve as the media center. Those individuals will be subject to a thorough security screening before entering and should allow additional time to access these facilities. No other individuals will be allowed access. The transportation plan below provides the general outlines for road closures, vehicular and pedestrian restricted zones, charter vehicles, pedestrian routes, and public transportation. Additional information is available online as indicated below via partnering agency websites. Additions to this plan may be made prior to the start of event and will be updated on agency websites. Specific questions regarding this transportation plan should be directed to the participating agency partners as identified above. Road closures, parking, and pedestrian restrictions are subject to change. Burke Lakefront Airport will close at 6:00 p.m. on Sunday, July 17. The airport will be accessible from North Marginal Road via E. 55th Street until 6:00 p.m. on this date. Burke Lakefront Airport will only be open to private aviation when the security gateway airports (Youngstown Airport and Canton-Akron Airport) are operational. Gateway screening will be from 10:00 a.m. to 12:00 a.m. on Monday, July 18 and from 2:00 p.m. to 12:00 a.m. on Tuesday, July 19 through Thursday July 21. The North Coast Harbor Marina will close to all marine vessels at 9:00 p.m. on Saturday, July 16. All vessels, crew, and passengers must depart the marina at that time. The marina will re-open to vessels at 6:00 a.m. on Monday, July 18. Deliveries for Prospect Avenue and East 4th Street must be conducted between 3:00 a.m. and 11:00 a.m. beginning on Monday, July 18 through Friday, July 22 at 6:00 a.m.
On Monday, July 18, Canal Road between East 9th Street Extension and Robert Lockwood Jr. Drive will be restricted to westbound traffic only starting at 12:00 p.m.
On Tuesday, July 19 through Thursday, July 21 Canal Road between East 9th Street Extension and Robert Lockwood Jr. Drive will be open for two-way traffic until 4:00 p.m. The following traffic restrictions will be implemented beginning at 10:00 a.m. Monday, July 18. Unless otherwise noted below, the restrictions will remain until 2:00 a.m. Friday, July 22. On Monday, July 18 through Friday, July 22, the Innerbelt Freeway will be closed in both directions nightly (Monday through Thursday) from 8:00 p.m. to 2:00 a.m. Transit and events associated with the RNC will potentially require extensive walking and outdoor exposure. The historical daytime temperatures for this time period is mid-to-high 80s, however, many reports have come across stating that this would be an above average summer in regards to temperature due to the La Nina. Attendees and other visitors are encouraged to wear comfortable shoes, make appropriate use of sunscreen, and to stay hydrated by consumption of water and non-caffeinated beverages. Attendees and other visitors on medications should bring enough medication for the duration of the visit, and as a precaution, are encouraged to carry the day’s medications with them. Attendees and other visitors with medical conditions are encouraged to keep a list containing their medical conditions, medications taken (including dosage and frequency), and physician’s telephone numbers readily identifiable on their cell phone or on their person. The FAA will have flight restrictions in place in and around Cleveland, OH during the RNC which will affect airport operations in the area and will restrict certain types of flight operations. Flights within certain areas will be subject to increased security procedures. Pilots are strongly encouraged to check NOTAMs frequently for possible changes prior to operations in the area or contact a Flight Service Station at 1-800-992-7433 to check for all current NOTAMs. Cleveland, OH and surrounding communities are No Drone Zones under the FAA flight restrictions for the RNC and local ordinances. Flying a drone in any of the designated restricted areas is against the law. Any unmanned aircraft –including radio-controlled model aircraft / UAS– are prohibited in the designated restricted areas. Anyone flying a drone within the designated restricted areas may be subject to civil and criminal charges. 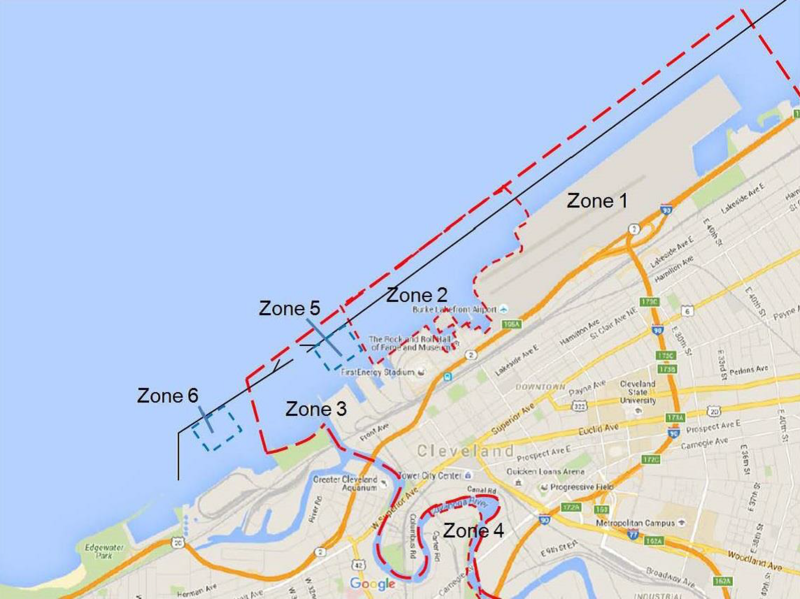 The Coast Guard has established temporary security zones for navigable waters within Lake Erie and the Cuyahoga River during the 2016 Republican National Convention from July 15, 2016 through July 23, 2016. The Coast Guard has also established two safety zones located northwest of the Rock and Roll Hall of Fame and Museum and on the Western side of the entrance to the Cuyahoga River to allow individuals expressing their views the means to do so in a safe manner. The goal of the Greater Cleveland Regional Transit Authority (RTA) is to do provide safe, reliable, clean and courteous public transportation to numerous destinations during the RNC. Current level of service On Sunday, July 17, the Waterfront line will be closed. RTA will operate its current level of service on buses, Paratransit vehicles and trains. Staff will be prepared to increase that level on traditional rail and commuter routes to serve individuals who are not regular RTA customers. Due to road closures and parking restrictions, customers are encouraged to take advantage of RTA’s 6,000 free parking spaces at rail stations and use the Rapid to get to the Tower City Station in Downtown Cleveland or across town. RTA’s free trolleys will help link customers from Public Square to all Downtown venues. RNC trolley service will be extended during the RNC until 1:00 a.m. The HealthLine operates 24-7 from Public Square to all Euclid Avenue locations. In addition, nine bus routes serve the Public Square area 24 hours a day. RTA’s rail service operates approximately 21 hours per day. Allow extra travel time Increased traffic volume may potentially cause delays on regular bus routes and on Paratransit services. RTA buses/Paratransit vehicles will NOT be allowed in the RNC restricted zones. For added convenience, RTA will sell a $20 special Convention weekly pass for unlimited rides between July 17 and 23. RNC Law Enforcement and Public Safety partnering agencies encourage members of the public, visitors, delegates, and public safety partners to share information regarding RNC security prior to and during the events by utilizing #RNCINFO on social media. Additions or updates to this plan may be made prior to the start of the event. EDITORS NOTE: For questions concerning this release, please contact the United States Secret Service Office of Government and Public Affairs at 202.406.5708. This press release will also be posted at http://www.secretservice.gov and on participating agency websites. what will be the hours of operation for the light and heavy rail trains during the RNC week?